Negotiate a US-Mexico bilateral labor agreement to manage low-skill migration. Appoint a US government lead for advancing labor mobility as a development tool. Launch a Global Skills Partnership pilot that addresses US skill shortages and expands trained workforces in developing countries. US development policy was built for a world that no longer exists. When the US Agency for International Development (USAID) was created in 1961, foreign aid was by far the most important flow of resources to developing countries. Today, aid is a relative sideshow. International migrants send roughly four times more money home to developing countries (close to $500 billion per year) than all donors disburse in global aid (roughly $130 billion per year). Remittances sent from the United States to Latin America and the Caribbean ($32 billion per year) are more than five times the combined US economic and military assistance to the same countries (less than $6 billion per year). Individuals earn much more in the United States than in their home countries, and they develop valuable skills through migration, often transmitting useful ideas and technologies back to their home countries. But US policies and institutions have not kept up with these trends. The US government employs thousands of people to shape foreign aid policy for development. Yet, it employs almost no one to shape migration policy for development. In other words, everyone’s guiding the sailboat, but the supertanker is adrift. This large imbalance offers a major opportunity to the next US president, who can leave an important legacy by rebuilding US development policy for this new century. But to do so requires serious engagement with the economic forces that now affect global development much more than foreign aid. And that means creating new policies and institutions in which migration and development intersect. This discussion is not a call to replace aid. Instead, it is a call to complement US assistance and foreign policy efforts with new policies that will shape the terms on which migration happens and advance US development policy goals in a cost-effective and politically sensible way. Among all of the development policy options the US government has, shaping international migration can produce the biggest development impact for the least fiscal cost. Unlike foreign aid, foreign workers do not reduce the availability of taxpayer resources in net terms. Instead, they create new revenue through tax payments. The Organisation for Economic Co-operation and Development (OECD) estimates that US immigrant households — including ones composed of irregular migrants — pay more than $8,000 per year more in taxes and social security contributions than they receive in social transfers. Indirectly, immigrant workers create additional tax revenue by fueling the economy. Not only do they make US capital more productive, but they also typically raise the earnings of average US workers, since immigrants and natives often specialize in different, complementary tasks. While migration generates benefits for the US economy, immigrants also benefit on a massive scale by moving to the United States. They earn more, they send money back to their home countries, and they develop skills that can be transferred to their home countries. Migration should therefore be a part of any sensible economic policy and a key part of any development agenda. The United States needs to play a more proactive role in the nexus between migration and development. Ignoring migration simply is not an option even though it is a controversial political issue at home. As it has for more than two centuries, the United States will remain an attractive destination for people around the world, especially those from developing countries. US policymakers can take steps on a number of fronts to simultaneously make the US economy stronger and make US development policy more effective. What follows is an outline of a few of the best options for modernizing US migration policy. First, the United States needs to take a more sensible approach to Mexican migration. Unauthorized immigration is an issue that can only be resolved if both the United States and Mexico acknowledge that migration between the two countries is going to happen, no matter how much America spends on enforcement. US and Mexican policymakers should create a bilateral agreement to lawfully manage the low-skill labor flows that inevitably arise from the needs of the US economy and the two countries’ shared geographic destiny. Second, the US government needs an agency, with dedicated human resources, to craft a modern and effective migration and development policy. Other developed-country governments, such as Australia and Germany, have created bureaus dedicated to formulating and implementing these win-win policies. But the US government has no lead agency, bureau, office, or staff with the primary responsibility of shaping migration flows for development impact. Finally, US migration policy should be used as a tool for human capital creation. The US economy faces shortages of skilled workers in a number of fields. These shortages hold back American businesses, harm American consumers, and do not pose aggregate risks for out-of-work Americans. Many developing countries also have skill shortages, often more dire than our own. US policymakers need to think creatively about interventions that can generate human capital to meet the needs of our economy, as well as those of much poorer economies around the world. A case in point on the need for modernizing US migration policy is the US-Mexico relationship. Mexican development and stability directly benefit the United States. Mexico is the second-largest buyer of US exports and the largest supplier of labor to the US economy. But US development cooperation with Mexico is focused mostly on aid money for security programs. In 2012, the United States disbursed $212 million in official development assistance to Mexico, while US remittances to Mexico were more than 10 times greater. There is almost no bilateral cooperation to shape regional labor mobility in ways that benefit regional development. Forces on both sides of the border encourage immigration. The difference in per capita gross domestic product between the United States and Mexico is the largest at any land border on earth. The United States demands large quantities of low-skill labor, and this demand will not subside anytime soon. 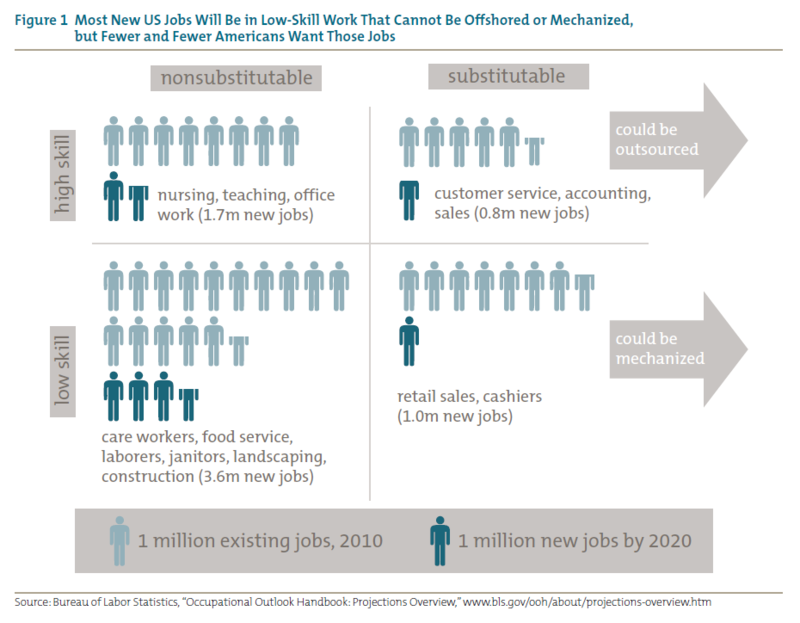 Most of the US jobs that will be created between now and 2020 will be in low-skill work that cannot be offshored or mechanized, such as care and custodial work that the country does not have enough willing and available American workers to fill (see figure 1). Furthermore, extensive economic evidence demonstrates that immigrants increase the productivity of not only their labor but also the labor of the Americans they work with. The availability of low-skill labor enables American workers to spend less time doing low-productivity work and more time doing skill-intensive work. For example, a highly educated woman might be unable to join the labor force because she has to spend time at home doing domestic work and child care. If she could hire a low-skill worker to do the same work, she could then join the labor force and produce at a much higher level. Low-skill labor allows Americans to specialize more — and therefore produce more. Mexican workers often have much better job prospects on the US side of the border. Mexican farmworkers make about $10 per day in Mexico. In the United States, the same people on temporary farmwork visas earn about that much per hour. Workers often send much of that income to their family in the form of remittances. Households in Mexico then have much more income that they can spend on better nutrition, education, and health care. Labor agreements to manage low-skill flows can be a three-way win: American firms get the labor they need, American workers are made more productive, and Mexican migrants and their families earn much more money than they could have otherwise. Moreover, previous agreements have dramatically reduced unauthorized immigration. During the peak years of the Bracero program, a US guest-worker arrangement that existed from 1942 until 1964, irregular migration dropped sharply. As soon as the program expired, unauthorized migration dramatically rose and has remained persistently high. The existing US immigration system neither adequately manages these forces nor harnesses the development power of low-skill migration. Existing legislation provides few opportunities for authorized low-skill migration from Mexico. The result — huge numbers of unauthorized immigrants — is untenable. Some of the most credible recent research on irregular migration estimates that six million unauthorized Mexican immigrants lived in the United States as of 2012. In addition to the large unauthorized population, many people who would benefit greatly from migrating are denied this opportunity under existing laws. Instead of earning higher wages in the United States, making US workers more productive, and sending money to Mexico to support their families, many prospective migrants must stay in Mexico, remaining unemployed or earning very low wages. Both Democrats and Republicans can find common ground in such principles. An agreement would promote enforcement and reduce unauthorized migration by channeling existing unauthorized flows through legal, regulated modes of immigration. A bilateral agreement could also promote better working conditions and protect migrants’ health if it ensured that all temporary migrants have safe living and working quarters. Policymakers on both sides of the aisle would find much to like in an agreement that made it easier for American companies to meet their workforce needs more reliably. This first round of negotiations took place between February 21 and September 7, 2001. Despite progress in these talks and momentum on both sides, the conversation broke down in the aftermath of the 9/11 attacks. The inevitable consequence was that the millions of Mexican workers who arrived to fuel the US economic boom of 2002–2007 had no legal status. Now, more than a decade later, it is time for the United States and Mexico to return to this important conversation and forge ahead with a bilateral low-skill labor agreement. A bilateral agreement for labor mobility between the United States and Mexico would normalize the migration relationship between the two countries and benefit both economies. Another way to leverage migration for development would be to task a US government entity with the responsibility of enhancing the welfare impacts of migration. There currently exists no office, bureau, or agency with the responsibility of creating policy, designing projects, or executing programs related to migration and development. Although some programs do engage with diaspora communities, no initiatives exist that facilitate labor mobility for development. The US government should support the creation of such an office because it is smart migration policy and smart development policy. As noted previously, migration is among the best options for many people living in the developing world to increase their incomes, but it is ignored as a development tool. Take Haiti as an example: Security and political interests drove US policy toward Haiti for many years in a country where US involvement has stretched back more than 100 years. US Marines occupied Haiti from 1915 to 1934 to protect US assets and solidify US security interests in the Caribbean. During the 1980s and 1990s, political concerns motivated multiple interventions. The United States also played a development role, contributing billions in assistance leading up to the 2010 earthquake. Since that tragedy, the United States has spent billions of dollars more on disaster recovery, but none of this funding has gone toward fostering labor mobility. Approximately 100,000 people who were born in Haiti and who still live there — about 1 percent of the population — live on more than $10 per day. Eighty-two percent of the Haitian-born people living above this threshold (about 500,000 people) reside in the United States. Although US development funding has not targeted migration, one result is clear: most of the Haitians who have escaped poverty have done so by migrating. US Agency for International Development: Foreign aid professionals in Australia and New Zealand have led the creation of highly successful labor mobility partnerships with their developing neighbors. One evaluation of such a program rated it among “one of the most effective development interventions for which rigorous evaluations are available.” USAID has no group designated to work on such partnerships. US State Department Bureau of Population, Refugees, and Migration (PRM): This bureau coordinates much of US assistance and protection to refugees and internally displaced victims of conflict. A migration and development office could complement the work that PRM and the State Department already indirectly pursue on migration policy. Departments of Labor and Homeland Security: These two US agencies manage existing temporary worker programs. Their roles could be expanded to accommodate other migration and development policies. The United States, among other rich countries, faces critical shortages in occupations such as engineering and nursing. Worker shortages in these sectors harm American businesses and consumers alike. Meanwhile, many developing countries face skill shortages in the same sectors. We propose a concrete, results-focused approach to address both of these shortages simultaneously through a bilateral labor agreement called a Global Skill Partnership. Such an agreement would facilitate training of skilled workers in developing countries, some of whom would eventually migrate to the United States. Those who migrate typically earn much more than those who do not because the economic productivity of the former would be significantly higher than in their country of origin. While destination-country wages would be higher, origin-country training costs would be much lower. Channeling a modest portion of this dual-arbitrage opportunity could finance training for migrants and nonmigrants (see table 1). For example, take two low-income individuals from a developing country who train as registered nurses. One plans to work in his or her home country; the other, in America. Nurse training is too expensive for them to afford, but it is much cheaper than nurse training in the United States. A US hospital group would finance all of the training for the nurse who would migrate and half of the training for the nurse who plans to stay in the host country. In return, the migrant nurse commits to work in the US hospital network for at least four years. With just a small percentage of his or her earnings over that period, the nurse can pay back the entire cost of training, while the training subsidy could cover half the cost of training the other nurse. In this instance, the United States would gain a qualified, licensed nurse whose net earnings are many times higher than what he or she could have earned in the developing country. The US hospital group employer gains a profitable employee trained to US standards, while the developing country gains an additional nurse with a sizable free scholarship (half of the training costs). As a result, two low-income individuals would gain access to professional careers that are otherwise currently inaccessible. In addition, the developing country expands the capacity and quality of its nurse training facilities, creating benefits that spill over into the rest of the health sector. Finally, there is no cost to either government. Instead, their roles are focused on connecting the US private employer to prospective trainees and ensuring that US licensing standards are upheld. Beyond this, other benefits could arise if the migrant nurse chose to remit some earnings home or to return one day to work in the origin country to provide additional health services to the local population. The US government should modernize its approach to migration and development despite the broader controversial domestic politics of immigration policies. The next US president should pursue a number of bipartisan actions in order to improve both development outcomes abroad and economic dynamics at home. None of these steps requires a proactive pro-immigration policy. Instead they simply seek to shape the terms on which existing migration flows happen — under the rule of law — so that they reduce unauthorized immigration, serve US economic interests, and are more development friendly. 1 Work with Mexico to create a bilateral labor agreement to manage low-skill migration more effectively. The US immigration system is not adequately equipped to handle either US employers’ demand for low-skill Mexican labor or prospective immigrants’ interest in pursuing opportunities in the United States. A practical plan for meeting US labor needs, based on sound economics, is the long-term solution to mass illegal immigration. Economically sound regulation of these labor flows will benefit the United States, which currently loses from mass unauthorized immigration, and would be one of the most powerful single steps the United States could take for development in the region. 2 Appoint a US government agency or bureau to leverage migration for development. The next US president, working closely with respective congressional committees, should establish a lead entity (either a bureau or office) for migration and development policy at an existing US agency. Countries such as Germany and Australia already have demonstrated strong results through similar efforts, thereby creating some of the most effective development interventions anywhere in the world. Creating such an agency would deliver unparalleled development returns, with only minimal US budgetary outlays. 3 Launch a Global Skill Partnership pilot. To address US and developing-country skill shortages, the next US president should instruct the US Department of Labor to coordinate a Global Skill Partnership initiative. This program could be pursued within existing budgetary outlays and could use official migration flows to expand much-needed human capital. Michael A. Clemens. “Economics and Emigration: Trillion-Dollar Bills on the Sidewalk?” Journal of Economic Perspectives 25(3): 83–106. Michael Clemens. “The Effect of Foreign Labor on Native Employment: A Job-Specific Approach and Application to North Carolina Farms.” CGD Working Paper 326, Center for Global Development, Washington, 2013. Michael Clemens. “Global Skill Partnerships: A Proposal for Technical Training in a Mobile World.” IZA Journal of Labor Policy 4(2). Manjula Luthria and Mai Malaulau. “Bilateral Labor Agreements in the Pacific: A Development-Friendly Case Study,” in Let Workers Move: Using Bilateral Labor Agreements to Increase Trade in Services, ed. Sebastián Sáez. Washington: World Bank, 2013. US-Mexico Migration Panel. Mexico-U.S. Migration: A Shared Responsibility. Washington: Carnegie Endowment for International Peace, 2001. OECD, “The Fiscal and Economic Impact of Migration” (policy brief, Organisation for Economic Co-operation and Development, Paris, May 2014), www.oecd.org/policy-briefs/PB-Fiscal-Economic-Impact-Migration-May-2014.pdf. Gianmarco I.P. Ottaviano and Giovanni Peri, “Rethinking the Effect of Immigration on Wages,” Journal of the European Economic Association 10(1): 152–97, doi:10.1111/j.1542-4774.2011.01052.x. Remittances from the United States to Mexico were $22.8 billion in 2012. World Bank, Bilateral Remittance Matrix 2012, http://go.worldbank.org/092X1CHHD0; OECD Development Assistance Committee, “Aid (ODA) Disbursements to Countries and Regions” (DAC Table 2a, OECD, Paris, September 2014), http://stats.oecd.org/Index.aspx?DataSetCode=Table2A. Michael A. Clemens and Lant Pritchett, “Temporary Work Visas: A Four-Way Win for the Middle Class, Low-Skill Workers, Border Security, and Migrants,” CGD Brief (Washington: Center for Global Development, April 2013), http://www.cgdev.org/sites/default/files/time-bound-labor-access.pdf. Michael Clemens, Claudio E. Montenegro, and Lant Pritchett, “The Place Premium: Wage Differences for Identical Workers across the U.S. Border” (CGD Working Paper 148, Center for Global Development, Washington, DC, December 2008), www.cgdev.org/publication/place-premium-wage-differences-identical-workers-across-us-border-working-paper-148. Giovanni Peri, “The Effect of Immigration on Productivity: Evidence from U.S. States,” The Review of Economics and Statistics 94(1): 348–58, doi:10.1162/REST_a_00137. Bryan Roberts, Edward Alden, and John Whitley, Managing Illegal Immigration to the United States: How Effective Is Enforcement? (New York: Council on Foreign Relations, 2013), www.cfr.org/immigration/managing-illegal-immigration-united-states/p30658. Jeffrey S. Passel, D’Vera Cohn, and Ana González-Barrera, Population Decline of Unauthorized Immigrants Stalls, May Have Reversed (Washington: Pew Research Center, 2013), www.pewhispanic.org/files/2013/09/Unauthorized-Sept-2013-FINAL.pdf. “Joint Statement between the United States of America and the United Mexican States,” September 6, 2001, http://georgewbush-whitehouse.archives.gov/­news/releases/2001/09/20010906-8.html. Michael Clemens and Lant Pritchett, “Income per Natural: Measuring Development for People Rather Than Places,” Population and Development Review 34(3): 395–434, doi: 10.1111/j.1728-4457.2008.00230.x. Frédéric Docquier, Elisabetta Lodigiani, Hillel Rapoport, and Maurice Schiff, “Emigration and Democracy” (Bar-Ilan University Working Papers No. 2011-02, 2011), www.econstor.eu/bitstream/­10419/96047/1/654920451.pdf. John Gibson and David McKenzie, “Development through Seasonal Worker Programs: The Case of New Zealand’s RSE Program” (Policy Research Working Paper 6762, The World Bank, Washington, 2014), http://www-wds.worldbank.org/servlet/WDSContentServer/­WDSP/IB/2014/01/28/000158349_20140128160906/­Rendered/PDF/WPS6762.pdf. Michael Clemens, “Global Skill Partnerships: A Proposal for Technical Training in a Mobile World” (CGD Policy Paper 040, Center for Global Development, Washington, 2014), www.cgdev.org/publication/global-skill-partnerships-proposal-technical-training-mobile-world. Kathleen Newland, “Leveraging the Links between Migration and Development: U.S. Government Policy, Practice, and Potential” (CGD Policy Paper, forthcoming).